The dimensions can vary but a Sheet is roughly 150 feet in length by 15 feet wide. 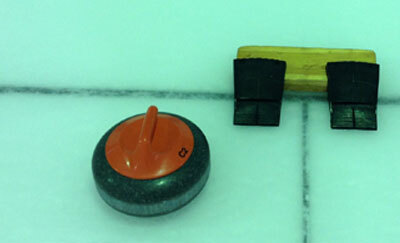 Modern facilities mean that curlers are assured of a clean smooth surface which is ideal for curling. The condition and characteristics of the ice forms an aspect of play and it is part of the skill of the game to master the behavior of the ice. At each end of the sheet there are circular rings known as the house which forms the scoring target for the game. These rings are known as the 4 foot, 8 foot and 12 foot due to their diameter. The centre of the house is referred to as the button or pot lid marking the spot! There is also a rubber block known as a hack from which the players push off to deliver their stones. The ice is also marked with boundary lines and a line known as a hog which has special significance in the course of play. Unlike a skating rink, curling ice is special and it takes a good team and particular talent to manufacture properly. The ice surface is not flat but prepared by spraying small droplets of water on to the surface to form ‘pebbles’. Trial and error surely discovered that stones travel much further and more predictably over this type of ice. Experience players know that as the pebble wears down over the course of a game it changes the way the stones run. The refrigeration plant and air conditioning in the curling hall has to be carefully regulated and controlled to make conditions ideal for curling and any variations in this do affect the playing surface.